Elucity Network, Inc., supports organizations and communities to do their best thinking together. A team of master facilitators, consultants and trainers design conversation processes for both multi-stakeholder and single stakeholder groups that are focused on everything from problem solving and developing their preferred “Bright Future” together to conflict resolution and innovation development. A Connect-Think-Do model of collaboration, communication and change has helped hundreds of client teams in business, universities, government agencies and nonprofits reach the higher ground of shared purpose and mutual respect with uncommonly high satisfaction ratings and long-term positive results. Elucity President and Chief Facilitation Officer, Marie Miyashiro, has been guiding organizations and leaders for decades. The field-tested approach she developed, Integrated Clarity®, transforms workplaces bottom up to top down. Participants make the leap from mistrust, missed opportunities and power plays to higher ground–a place bringing out the best in people and their best thinking together–where new directions and insights bring results: smoother productivity, smarter success, increased innovation and a higher calling at work. She designs and facilitates unexpectedly transformative and enjoyable conversations that matter. 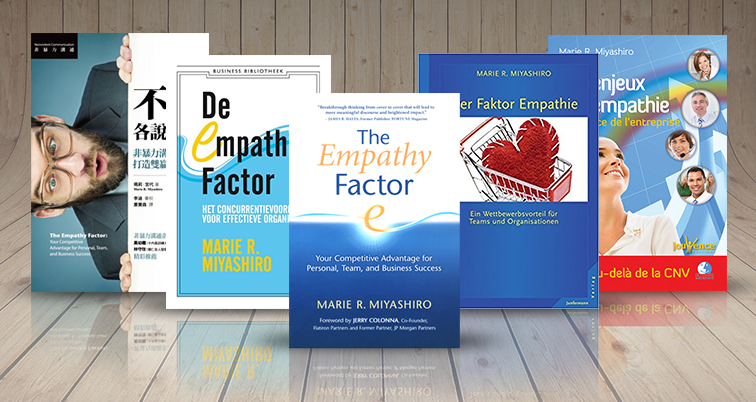 Her book, The Empathy Factor – Your Competitive Advantage for Personal, Team, and Business Success, was published by PuddleDancer Press in 2011. The foreword is by Jerry Colonna, a top financier for the new economy. Endorsements for it come from business leaders, including Jim Hayes, former Publisher of FORTUNE magazine, academic deans and faculty, and nonprofit leaders. Integrated Clarity® is featured in The Change Handbook – The Definitive Resource on Today’s Best Methods for Engaging Whole Systems and the chapter is co-authored with Marshall Rosenberg, Ph.D., of the Compassionate Communication process. She has more than two dozen partnering and communications awards working with Fortune 500 clients, nonprofits, unions, universities and government agencies. Elucity is passionate about workplaces that embrace and capitalize on the human element instead of tolerating, dismissing or “managing” it for us—profit, morale and technology make up the three-legged stool. We do this in two ways; first, we work with clients from a wide array of geographic areas and industries with the services we offer. We’re here to help our clients discover and explore how to increase productivity and profit in balance with people needs. Second, we serve as an information and training resource and support system for consultants, coaches and facilitators/trainers who want to practice the Integrated Clarity®, Nonviolent Communication and other needs-based participative approaches to workplace consulting and training. Individually and collectively, the firm has built careers around finding more ways to make profit and organizational sustainability an enriching human effort as well. That’s why we’re here. Elucity is looking for clients and consultants, facilitators and trainers who want to collaborate with us in our quest for workplace and organizational results by capitalizing on and celebrating the human elements rather than tolerating, “managing” or ignoring them. We want to profit with our clients, employees, partners and collaborators rather than from them. Our framework engenders self-reflection and conscious personal growth. We think profit is something that happens inside of us, as well as in the bottom line. The firm believes in “natural growth”— that our success will come as a by-product of serving universal human and organizational needs in the clients and collaborators we serve. Our Elucity client list includes: National Telecommunications Companies; State and Private Universities and Colleges; Fortune 500 to Small Businesses; International and Local Nonprofits; State and Federal Government Agencies; Healthcare Facilities and Associations; State and National Education Associations; International and State Industry Associations. In the 1990s and continuing into 2005, an international industry association experienced stagnation of growth in membership. Its members were also experiencing high turnover in their institutions. The president of the association, for the first time, included task committee chairs in a board of directors’ retreat, inviting the group to clarify its vision and mission in a newly participative way that focused on organizational needs. Since 2005, Elucity had worked periodically with this group and its new president in 2010 to define and meet their six organizational needs. 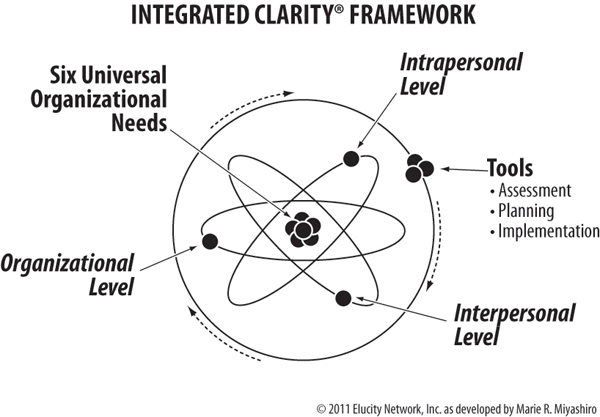 The Integrated Clarity ® (IC) process is built on an adaptable whole-system change framework that integrates the work of Jim Collins, Kimball Fisher, William Bridges, and current organizational thinking from other leaders in the field. The IC process involves a series of strategic conversations, the results of which are implemented over a timeframe that averages about four years. The strategies are first developed in a series of discussions; they are then implemented and tested; and finally, they’re refined over time. This group began with a discussion of Identity and Life-Affirming Purpose and later addressed Direction. Their clarity about Structure, Energy, and Expression needs grew organically out of these conversations, as elements of Elucity’s IC model were determined. The group’s Passion of “Coming together in the spirit of collegiality and camaraderie to share, renew, inspire, and collaborate in service of advancing their industry,” took two-and-a-half days to determine. The robust, highly dynamic, and highly sophisticated dialogue was intended to bring out the wisdom of each person, which collectively creates a result greater than any one person could come to on his or her own. The insight of “coming together”(as a crystallization of their Life-Affirming Purpose) sounds simple; but up to that time, they were modeling themselves on fairly traditional organizations, and that was about to change. They immediately applied their new insights to the annual conference coming up in a few months. Intention drove the structure of the conference rather than the other way around. For example, instead of focusing on a structure such as five sessions of seventy-five minutes each, they asked, “What format would be most conducive to ‘coming together’?” They found that the most exciting part of the conference wasn’t the sessions but getting together in between sessions and for lunch or for social connections after formal sessions. Hence, they conducted more casual professional development by having a speaker over lunch, for example. They flip-flopped their conference schedule, and as a result, they received the most positive feedback they’d ever had on the post-conference survey. The conference appeared more like their unifying statement in action and conference participants found value and power in coming together to enhance their collective identity, exchange ideas, and provide practical problem solving. The association used “coming together” as the litmus test to keep, develop, or stop its various programs or activities. For example, the group eliminated the telephone mentoring program because of its one-on-one structure. This mentoring didn’t have the camaraderie of “coming together” that the whole group had—which was confirmed by the fact that people hadn’t shown as much interest in this program as other events that had the “coming together” component. The group began to track “coming together” time as a quantifiable measurement. The group had its highest annual conference attendance ever that year. Within two years of determining its purpose and changing the structure and manner in which it operated, membership increased by 27 percent and continued to grow through 2010. The group dramatically improved its ability to serve its members. Numerous strategic opportunities are now being determined for future services, conferences, and benefits for its members. The leaders became clear on how the board, committees, staff, and members could work together and how the organization could become a mechanism for members to provide input into national policy issues. They also determined how to describe this Structure and its implementation at the Fall 2010 conference and in so doing, engaged more leaders in the effort to elevate their strategic goals.